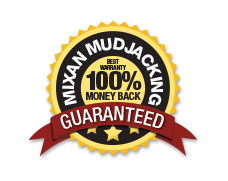 Mudjacking | Mixan Mudjacking Inc. The Alternative to Concrete Replacement! Mudjacking is a method of raising concrete that involves drilling 1 inch holes through the concrete surface and injecting a grout based material to fill under any slab. This will fill voids and raise the concrete section to the desired grade. The procedure can be used to raise virtually any rigid pavement. After the void is filled and the concrete is raised to the desired height, the holes are then filled with concrete. These holes match very well with existing concrete. The newly concreted holes darken with age, it usually matches very well within 1 - 8 months depending on age of existing concrete. 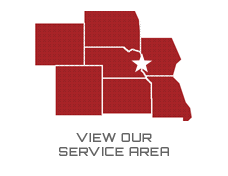 With our specialized equipment we can raise anything from 1/32 inch up to several feet depending on the job. What are the costs of raising concrete or filling voids under slabs? The cost varies from job to job, that is why it is necessary to make an inspection of each job before giving a free estimate. However, it usually costs half or less of replacing concrete. What are the savings over concrete replacement? Yes, the material we fill your void with is crushed rock. The rock will not break down over time and is less likely to erode. Most sinking is caused by compaction or erosion of soil under the slab. This usually occurs around the foundation of newer construction, leading to drops in the front of your driveway, in sidewalks near your home, and in concrete slabs over the utility trenches leading into the home. In older construction, there can be drainage problems which causes soil to erode or compact. Even if the concrete is torn out and replaced, the same problem can occur unless the compaction process is finished or the drainage problem is corrected.